What Kind of Wildlife Live in the Deserts? What Climate Is Landlocked and Gets Little Precipitation? The low rainfall and high rates of evaporation in desert landscapes combine to form a very dry, or arid, environment. Deserts receive the bulk of their annual rainfall during a single season, so desert biota must endure long drought periods. Desert environments are not always hot, however. Deserts can be found at high altitudes and in polar regions, where water is frozen for most of the year. Deserts are home to a surprisingly diverse range of plants and animals, whose physical, physiological and behavioral adaptations help them cope with the harsh conditions. Water conservation is vital to surviving in the desert. Desert plants conserve water by minimizing water loss through the surface of their leaves. Many have the ability to close leaf pores, called stomata, through which gas and water are exchanged, during drought conditions. Desert plants can even photosynthesize at night, so that stomata are not open during the heat of the day. Many desert plants, such as the brittlebush, reduce the temperature of their leaves by reflecting sunlight with a thick covering of hairs. Small leaves are another way of reducing water loss. One of the best examples of a small-leaved plant is the cactus, which has reduced its leaves to spikes. Some desert plants also store water. These include succulent plants, such as aloe and barrel cacti, which have stems or leaves containing spongelike cells that absorb water, and plants with underground storage, such as bulbs and rhizomes. A common drought-avoidance strategy adopted by desert plants is an annual life cycle. Annual plants germinate and grow during the rainy season. When the ground dries up, annuals produce seeds and then die. Seeds lie dormant in the soil over the dry season. Annuals include many species of grasses and wildflowers. Annual plants often grow beneath desert shrubs, which provide shade, and draw water to the surface, where it can be accessed by shallow-rooted annuals. Prickly leaved shrubs protect annuals from grazing animals. Desert animals have developed behaviors that help to regulate body temperature and reduce water loss from the body. Underground burrows insulate animals from both heat and cold. In cold deserts, many mammals huddle in burrows at night to share body warmth. Larger animals, such as zebras and lions, are too big to fit in burrows. In hot deserts, some dig hollows so they can lie on cooler earth beneath the surface. Almost all animals will shelter from the sun during the hottest part of the day, if shade is available. Coyote, bobcats, antelope squirrels and kangaroo rats, along with many other desert animals, are most active at night when the air is cool. 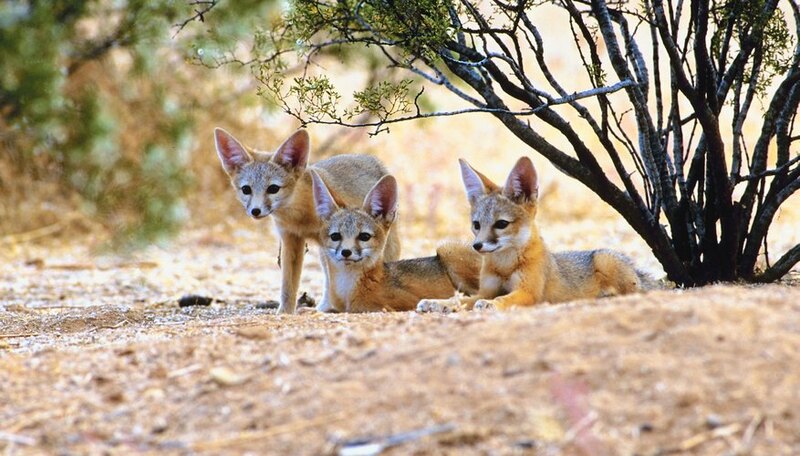 Desert animals are physically and physiologically adapted to the desert ecosystem. One Arabian oryx adaptation, like many animals that live far from water, is to get most of the water they need from their food. Additional water can be produced when food and body fat is metabolized by body cells, a process known as cellular respiration. The camel’s hump contains stored fat that can be used as a source of water on long journeys. Birds, insects and reptiles are able to conserve water by excreting highly concentrated waste, called uric acid. Many desert animals, such as jackrabbits, giraffes, ostriches and desert foxes, increase surface area available for heat loss with large ears, and long necks and legs. The hair and feathers of desert animals, found in thick layers on animals such as camels, desert sheep and ostriches, can insulate against both heat and cold. Sweating and panting, desert adaptations known as evaporative cooling, helps many large mammals to accelerate heat loss. Based in Vancouver, Kirsten Campbell has been a professional ecologist since 2006. She has worked with various governmental agencies and in the private sector. Campbell holds a Master of Science in ecology and conservation. How Do Desert Plants Adapt to Their Environment? Campbell, Kirsten. "Biotic Factors in Deserts." Sciencing, https://sciencing.com/biotic-factors-deserts-22440.html. 16 July 2018. What Types of Adaptations Must Desert Animals Make to Conserve Water?